The documentary-style film, Is Genesis History, (IGH) lays out clearly and concisely the implications of a literal-six-day and global flood interpretation of the early chapters of Genesis. While providing only a bare-bones defense of the biblical case for a literal-day interpretation, the film uses most of the screen time to explore how young earth and global flood advocates interpret observations from the fields of geology, astronomy, biology and to a lesser extent archaeology. I have a broad knowledge of the young-earth creationist (YEC) literature. I saw the film in the theater and have watched it again on DVD. I believe the views expressed in this film accurately reflect the current consensus of young-earth view of Earth’s history. Therefore, this film would provide a good introduction to the young-earth creationist’ worldview. The filming locations are dramatic and compelling. The script is well-honed and the narrator, Dr. Del Tackett, is well-spoken and engaging. There have been many feature-length films produced by creationist organizations but none have found the balance of eye-catching video and effects with a carefully edited and written dialogue that this one accomplishes. Another important feature of this film that sets it apart from others is that it isn’t the direct product of one of the major creation science organizations. Other films have become self-absorbed with organizational pet projects and theories and—more importantly—often become sales-pitches for their own missions and products. 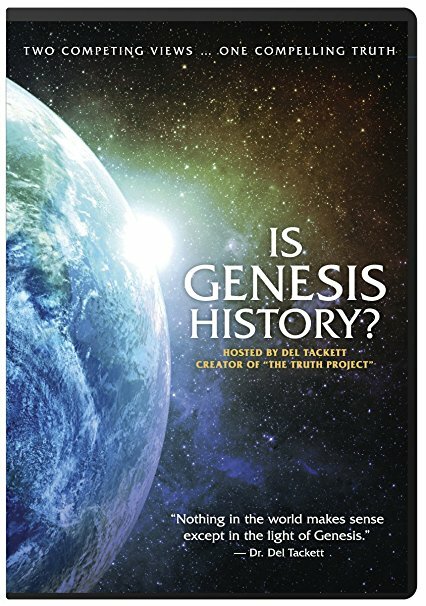 The videos produced by Answers in Genesis (AiG) and Institute for Creation Research, like their seminars, are filled with advertisements and promotions for their books, videos and theme parks. This movie begins and ends without any mention of specific organizations or promotions of other materials. Only in the 20 minute interview that follows are two organizations mentioned. The producer of this new film, Thomas Pulfroy, employs Christian apologist Dr. Tackett as a narrator. Dr. Tackett gained his popularity for his work outside of creationism. As such he brings a greater appearance of impartiality to the film, especially given the way the film was originally promoted as an examination of two different worldviews. Some of the audience would be forgiven if they believe that Dr. Tackett had spoken to experts who represent a wide variety of creation interpretations that exist within the church and is now presenting his expert assessment of that analysis. The more aware audience member will realize that he approached the project from within the young-earth paradigm right from the start and never questioned that paradigm. Even so, he does benefit from having no particular agenda to push with respect to the many scientific and theological differences that exist among young-earth organizations. I wrote an essay about the final scene of this movie which was published at BioLogos.org just after the movies was shown in theaters. I expect this film to become one of the most effective apologetics tools the young-earth movement has ever produced both because of who produced it—a group outside of the major creationist organizations—but also because of who is not in the film—AiG president Ken Ham. Ken Ham has become such a dominant force in the creationists’ movement that almost nothing of consequence seems to come from the movement without his fingerprints, and usually his face, all over it. However, although Ken Ham brings more sales and attention than any other YEC leader, there is also a measure of baggage that come with any association of him with a project. This film includes two of his employees but their affiliations are not identified until the very end and the film makes no mention at all of Ken Ham and his Creation Museum or the Ark Encounter theme park. In contrast to Ken Ham’s combative personality, Del Tackett has a level of respect that Ken Ham can’t achieve because of his past projects and because he is perceived as removed from the very small inner-world of YEC leadership. Del Tackett is the antithesis of Ken Ham in many ways. He takes strong stances without coming off as intolerant while still clearly believing that a young-earth worldview is of critical importance. In addition to not allowing Answers in Genesis to dominate the film, the choice of “experts” that Del Tackett interviews in the films represents a broad cross-section of the larger YEC community. Several are members of the much lesser-known Logos Research Associates organization and a quarter of them (eg. Ross, Wood, Chadwick) are not employed by any of the major creationist organizations. By including experts from multiple organizations and some that are “outside the beltway,” Pulfroy has made a film that all YECs can get behind which should help it find a much wider audience than had it been produced by one organization. I have observed that every major creationist organization has been promoting and selling the film to their constituencies. I should note that there is one creationist organization that is conspicuous in its absence in the film itself. There are no experts from the Institute for Creation Research (ICR). I can’t be sure if this was a conscious choice or simply a logistic problem, however, ICR undertakes little meaningful research anymore and it is easy to see that their experts would not have added anything beyond what could be gained from other independent experts. In summary, although the film presents, as observed in many other reviews here, here, and here, selective facts, suffers from mischaracterizations of other viewpoints, and presents a false dichotomy to its audience, the target audience is unlikely to be aware of these flaws. Rather, the appearance of being an independent analysis led by a respected Christian apologist combined with high production quality are likely to be compelling to a trusting audience which is why I consider this film to be a significant achievement for the YEC community at large. « Was The Young-Earth Perfect Prelapsarian Paradise a Maladapted World? I have watched some of the “Truth Project” films. They are remarkably ‘truth-free’. The presenter was very, very good at dominating his studio audience, and beating them down into mental passivity through what are, frankly, the same sort of mind tricks that cults and marxist dictatorships employ. This cannot be accidental! You have to work long and hard to be such powerful liars and brainwashers. Is Steve Austin not with ICR any more? Have you seen the extended interviews on the IGH website? Austin hasn’t been directly associated for ICR for a number of years now. He is part of the Logos Research Associates group. I’ve only just watched a few minutes of a the extended interviews. I need to watch some more of those.